A major portion of one of the country’s largest airport expansion projects in recent history has been completed by Sundt Construction, Inc. and joint venture partner Kiewit Construction. 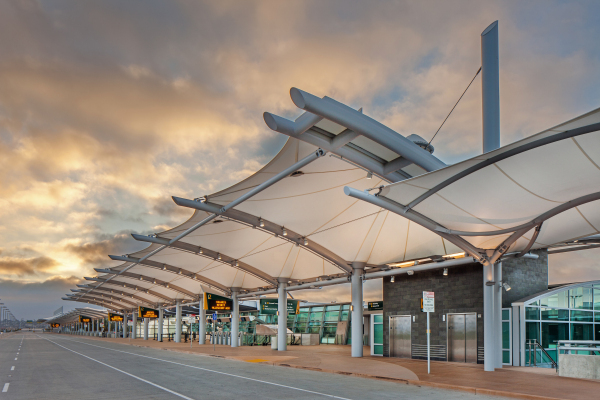 Working together as Kiewit/Sundt, the pair performed a $230 million, design-build project at San Diego International Airport that involved extensive additions and improvements to the landside area in front of Terminal 2. Perhaps what’s most impressive is the way the team planned and executed its work in order to keep the facility open and avoid disruptions to the public. “Our whole goal was to minimize impact to the airport operations,” said Brad Kirsch, the Sundt project manager who planned and supervised the placement of two new pedestrian bridges that extend over the main terminal roadway. The structural steel bridges – each weighing approximately 100 tons – were assembled at an alternate location on the jobsite, rather than in place, and then installed in a single night. The team’s innovative approach meant that the main terminal roadway was only closed for a few hours, rather than the several weeks that would have been required by a more traditional build-in-place approach. That’s a big deal at an airport that handles as many passengers as San Diego International. The Federal Aviation Administration deems it the nation’s busiest one-runway facility, with an expected annual passenger volume of 33 million by 2030. Another significant element of the project was the construction of a new, 1,255-foot-long, dual-level roadway in front of the airport to separate arriving and departing passengers. The change enhanced curbside passenger processing, allowing most passengers to check in, obtain boarding passes, check baggage and receive all flight information in an “open-air” ticket lobby environment. After checking in at this easy-to-use curbside kiosk, passengers enter the terminal using one of two pedestrian bridges. 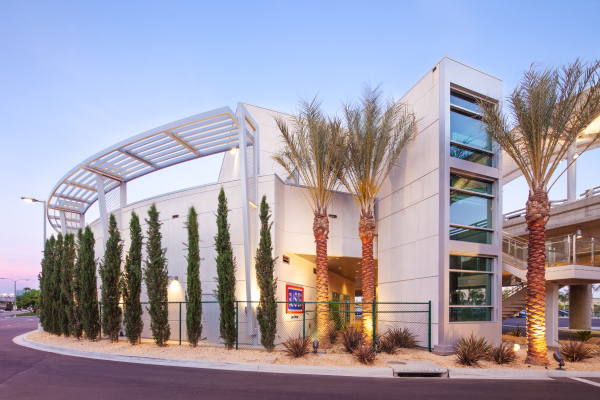 The team also constructed a new building for the USO San Diego and a parking management office. Kiewit/Sundt’s contract formed a significant part of the airport’s comprehensive, $1 billion project known as “The Green Build,” so named for its emphasis on sustainability and LEED silver certification from the U.S. Green Building Council. Kiewit/Sundt’s work received the Project of the Year Award from the San Diego Chapter of the Construction Management Association of America (CMAA). The award is the top prize annually for outstanding achievement in the practice of Construction Management. • Opened the short-term parking lot 70 days ahead of schedule, allowing the Airport Authority to collect critical parking revenue fees earlier than they expected. • Mitigated impacts to the public, including an impressive operation to install two pedestrian bridges overnight and only close the roadway below for a matter of hours. • Set the bar high for small and disadvantaged business participation, achieving 34% participation by this demographic. The team developed a program to engage and mentor the small and disadvantaged businesses to help them grow their businesses and promote long-term success. • Earned LEED Gold certification from the U.S. Green Building Council, exceeding the Airport Authority’s requirement for Silver. 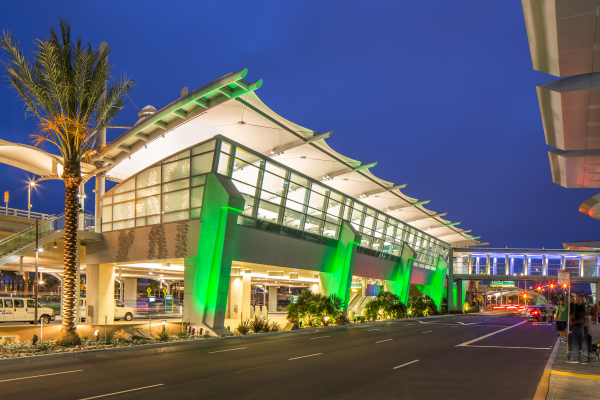 The San Diego International Airport Terminal 2 Landside Expansion, which was part of a project known as The GreenBuild, introduced a new 1,300-foot-long dual-level departures roadway in front of Terminal 2 which separates and simplifies departing from arriving passenger traffic. This major airport infrastructure project also included the construction of two outdoor, curbside check-in lobbies (Smart Curbs), an expanded transit center, two pedestrian sky bridges, a new USO and Parking Management office building, six bridge overpasses, new roadways, and reconstructed parking lots.